Israeli forces banned Palestinians from entering Al-Aqsa Mosque to allow Ariel and the accompanying settlers to walk around the compound and perform Talmudic rituals. 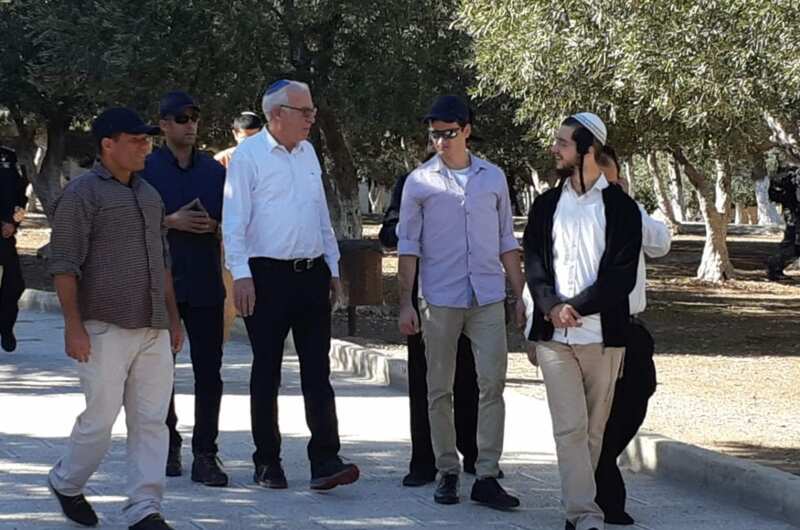 Israel’s Minister of Agriculture Uri Ariel stormed Jerusalem’s Al-Aqsa Mosque under heavy protection from Israeli police on Sunday morning, accompanied by dozens of extremist settlers. Israeli forces banned Palestinians from entering Al-Aqsa Mosque to allow Ariel and the accompanying settlers to walk around the compound and perform Talmudic (Jewish religious law) rituals. Israeli authorities continue to restrict the entry of Palestinians to Al-Aqsa Mosque and impose punitive measures on them. Only a few days ago, the Jerusalem Magistrate’s Court ordered six Jerusalemite Palestinians to be expelled from the mosque and banned their entry into the compound for six months. An official in the Palestinian Prisoners Club in Jerusalem said that Israeli forces arrested the six Jerusalemites from their homes in the Old City and Silwan, just outside the Old City Walls, several days ago.